Russian President Vladimir Putin flew to Crimea on Friday to take part in the Victory Day festivities in Sevastopol, which marked the 69th anniversary of the Soviet Union's victory over Nazi Germany in World War IIand the 70th anniversary of the liberation of Sevastopol. 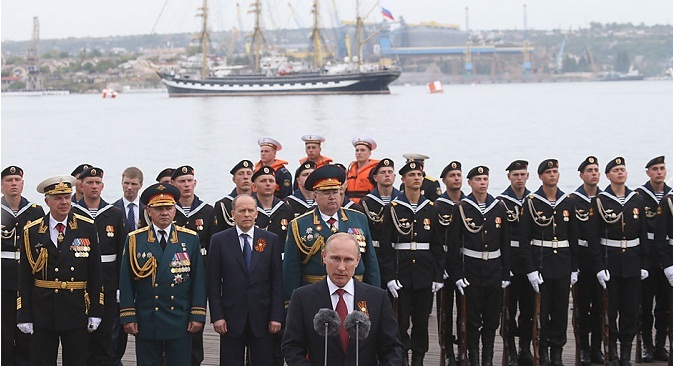 During his visit, his first since the takeover of the Black Sea peninsula two months ago, Putin watched a military display by over 1,000 servicemen, 70 warplanes and helicopters, and more than ten warships of the Russian Black Sea Fleet in Sevastopol’s harbor. The parade was accompanied withan aerial display bythe Strizhi (MiG-24) and Russian Knights (Su-27) aerobatics groups. The president walked from the pier to the city’s WWII memorial. All along the way he was greetedwith adulation by Sevastopol residents, who lined the roadswith cries of "Russia! Thank You!" Putin paid homage to the generations of Sevastopol residents who had fought to defend the city at various times in the peninsula’s history. “The example of Sevastopol has shown the entire world that where people are determined to fight for their own land, their own dignity and freedom, the enemy will not pass," Putin said. "The 160th anniversary of Sevastopol's heroic defense during the Crimean War will be marked in September. I am certain that 2014 will also go down in the [city's] chronicles, and the chronicles of our entire country, as a year when ethnicities living here made the firm decision to be together with Russia," he said. In what appeared to be a veiled reference to the West’s reaction to Moscow’s takeover of the peninsulain March, Putin asked for Russia’s interests to be respected. “We treat with respect all countries and all nations, respect their legitimate rights and interests, and we are asking that everyone treats our legitimate interests the same way, including the restoration of historical justice and right for self-determination," he said. Putin’s trip to Crimea was met with disappointment in the West, with NATO Secretary General Anders Fogh Rasmussen describing Putin's visit as "inappropriate,” while the United States criticized it as provocative and repeated its rejection of Russia’stakeover of the peninsula. "This trip is provocative and unnecessary. Crimea belongs to Ukraine and we don't recognize, of course, the illegal and illegitimate steps by Russia in that regard," said State Department spokeswoman Jen Psakiin comments to reporters at her daily briefing. U.S. National Security Council spokesperson Laura Magnusonsaid: "We do not accept Russia's illegal annexation of Crimea. Such a visit will only serve to fuel tensions." The government in Kiev, meanwhile, labeled Putin's visit a deliberate "provocation" intended to escalate the crisis. The European Union is likely to strengthen its targeted sanctions against Russia on Monday, Janusz Lewandowski, a member of the EU's governing commission, said on Friday. Diplomats said they would target about 15 people and several Crimean branches of Ukrainian companies taken over by Russians. The story is a combined report based on materials from Interfax and Reuters.